Not only are zoodles (or zucchini noodles) a lighter pasta alternative, they also dont require any boiling, saving you time in the kitchen. 1 medium tart green apple, cored and thinly sliced. Use a spiral vegetable slicer to cut noodles into long thin strands (or use a vegetable peeler to cut into ribbons). Use a kitchen scissors to cut through the strands to make them easier to serve. Heat 2 tablespoons of the oil in a very large skillet over medium-high heat. Add the garlic. Cook, stirring constantly, for 2 minutes or until softened and just starting to brown. Add zucchini; cook and toss with tongs for 1 minute. Transfer to a serving bowl. Add walnuts to skillet. Cook and stir for 1 to 2 minutes or until toasted. 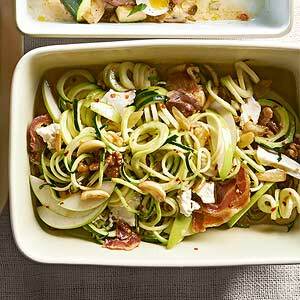 Add to bowl with zucchini. Add salt and crushed red pepper; toss to coat. Add remaining oil to skillet. Add prosciutto. Cook for 1 minute or until browned and crisp, turning once. Add to zucchini mixture along with apple. Toss to combined. Top with pieces of goat cheese.